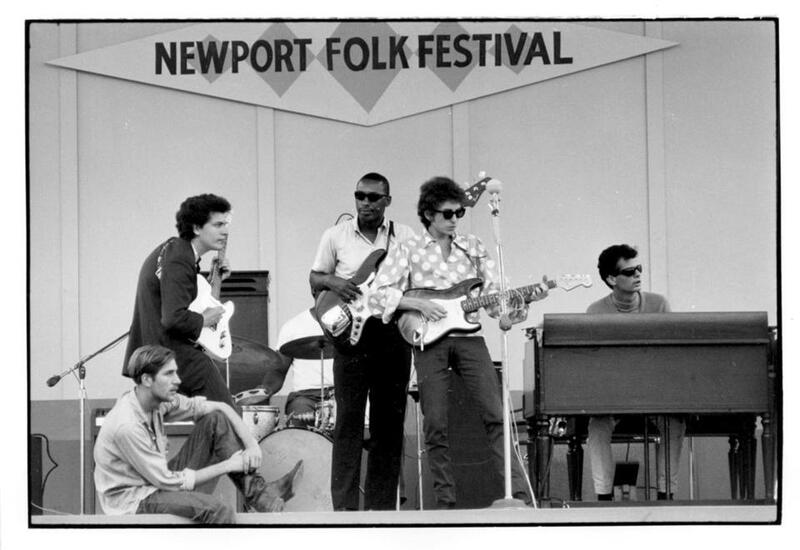 Bob Dylan (center) at the 1965 Newport Folk Festival, accompanied bykeyboardist Al Kooper, who will join in a Dylan tribute concert at the Berklee Performance Center on Feb. 28. When British pop-soul superstar Adele first burst onto the US music scene, “Make You Feel My Love” , a cut from her 2008 debut album, became a popular choice for female vocalists auditioning for admission to the Berklee College of Music. “I’d tell them, you should check out Bob Dylan’s version,” recalled Berklee professor Ken Zambello. Often, he said, the young singers had no idea that “Make You Feel My Love” is Dylan’s song. Then again, Dylan has been covered so many times, it’s easy to lose track. More than a thousand covers of Dylan songs have been recorded, some of them instantly recognizable, like the Byrds’ jangling rendition of “Mr. Tambourine Man” or “All Along the Watchtower” by the Jimi Hendrix Experience. Others are a little more unexpected, such as French chanteur Hugues Aufray’s lively translation of “Mr. Tambourine Man,” or Turtle Island Quartet’s “All Along the Watchtower,” with Hendrix’s indelible solos translated into violin, viola, and cello lines. Now, Zambello, the coordinator and musical director of special concerts and programs at Berklee, is helping to produce an event that aims to add 15 more interpretations. On Feb. 28, Berklee students and faculty will perform original arrangements of some of Dylan’s most memorable songs. The event, titled “Great American Songbook: The Music of Bob Dylan,” will feature unusual adaptations of music that is typically performed by solo guitarists or rock ensembles. The concert will feature an appearance by Al Kooper, who played keyboard with Dylan at the 1965 Newport Folk Festival when the iconic folk singer famously “went electric.” Kooper, who played the signature organ riff on “Like a Rolling Stone,” is expected to perform his own take on “It Takes a Lot to Laugh, It Takes a Train to Cry,” one of Dylan’s more widely covered songs, Zambello said. The Berklee performers may borrow from Dylan’s arrangements and those of artists who famously covered him, Zambello said, but won’t attempt to duplicate them.